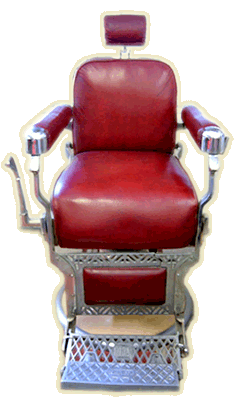 Before the Kokens and Belmonts, Paidar barber chairs ruled the barber chair market in the United States. The Emil J. Paidar Company was based in Chicago and has been the leading manufacturer of barber chairs until the late fifties. The company has been making these chairs since the early 1900’s. As the market leader, Paidar’s designs were generally the baseline and were often imitated by competing manufacturers. Things began to change in the late 50’s, when Belmont joined Japan-based Takara Chair Sales Co., Ltd. Takara Chair Sales was originally a division of Takara Chuzo Ltd. but eventually became independent in 1951. The original company, Takara Chuzo Ltd. was founded by Hidenobu Yoshikawa in 1921. By the 1930’s, Takara barber chairs have become an established brand in Japan. Twenty years later, the company established an overseas subsidiary in the United States aptly named as Takara Company N.Y. Inc. By 1959, they have expanded in Europe by establishing is affiliate, Belmont Chairs London Ltd. Belmont would eventually become the international brand name of Takara. Fast forward to 1969 and the Takara Belmont Co., Ltd. was born. This was the product of a merger between Takara Chukosho (formerly Takara Chuzo) and Takara Chair Sales, a manufacturing arm and a sales specialist put together. It was also in 1969 that the struggling St. Louis-based Koken, Incorporated was acquired by Takara Belmont. The purchase included Koken’s patents, trademarks and the brand name itself. Because of this, Takara Belmont became the dominant manufacturer of barber chairs in the US. By 1970, it had already grabbed 70% of the market share, ultimately making Paidar a small competitor. Emil J. Paidar vintage barber chairs are priced substantially in auction sites and antique shops. If you are looking for one, take a look around to have an idea of the going price. Make an effort to negotiate something that is about a quarter of a percent less than the rates you can find online. Don’t hesitate to ask the antique shop owner to give you a better price. Then again, Paidars are made with the finest materials, and each one is built with care. So you should expect a slightly higher initial price tag if the condition is pristine. If you managed to buy one, you should know how to take care of the chair. Dusting should be carried out using a soft, lint-free cloth. The wooden parts should only be waxed with beeswax that has a good quality. Refrain from positioning the chair in bright light or in rooms with abrupt temperature or humidity changes. When moving an antique chair, always lift it. Dragging will result to unnecessary troubles that can affect the value. I purchased a Paidar hydraulic chair which I believe to be early 30’s. I found the number 590 underneath the base and also 11-30 underneath the base. Does anyone have info on the meaning of these numbers?